Mojang's foray into a 2D plane is coming along quite nicely, judging by the above trailer. 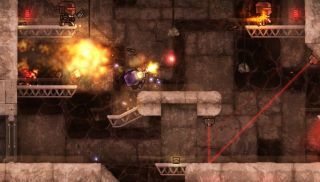 While it does feature a single-player component, it's increasingly looking as if Cobalt's main appeal will be its couch competitive mode, and the time dilation system will play a huge role. If like me, you've been confused about how it works, the video above serves to explain it, and it looks pretty cool. Basically, when an enemy's projectile comes within your range, time will slow down to allow a quick escape. There are ways to deprive your opponent of time dilation, though: you can snipe them, or you can use certain power-ups in order to bypass it. There's not long to wait until we can try it for ourselves: Cobalt releases February 2, which is this week.